So I've been hearing about this one for quite some time. 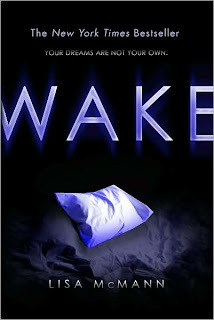 And I confess, I deliberately waited for Wake to come out in paperback before buying it. (No, my library does not have it. Sigh). I figured that way if it was only so-so, I'd have spent less on it. But if, as I was hoping, it was Teh Bomb, then I'd be that much closer to the sequel coming out. It was, ahem, the latter. And now Fade is out! Must secure a copy. Janie has a hard time sleeping. What with the being sucked into everyone else's dreams without so much as a by your leave. If she's alone in her room with the door shut, she's usually fine. But all she has to do is walk by someone who's sleeping and bam! She's living their dream or nightmare right along with them. And the thing is, they often look right at her and ask her for help. But Janie has no idea how to help, or why this curse chose her life to wreak havoc upon. As if she didn't have it hard enough trying to get by with an alcoholic mother, no father, and no money to pay for college and a way out. She does have a part-time job at a nursing home, a kind, if somewhat unreliable friend Carrie, and a loner boy named Cabel who, after she storms out of a school dance, pushes her home on his skateboard. When she feels the hand on her shoulder, she jumps. A mile, a foot, an inch . . . she doesn't know. "Ready?" he says. "Didn't know if you heard the bell. She nods and grabs her books. "Yeah." Her voice is not completely back yet. She clears her throat. "Yes," she says firmly. "Are you? You have a dent in your cheek." She smiles shakily. "Fell asleep on my book." "I, uh, must've been really tired, I guess." "You look freaked. Did you have a bad dream or something?" She looks at him as they walk through the crowded hall to government class. He slips his hand onto the small of her back so they stay together as they talk. "Not exactly," she says slowly. Her eyes narrow. "Did you?" The words come out of her mouth like gunshots. He turns sharply into the doorway as the bell rings and he sees the look on her face. He stops in his tracks. His eyes narrow as they search her face. She can see his eyes are puzzled. His face flushes slightly, but she's not sure why. The teacher comes in and shoos them to their seats. Janie looks over her shoulder, two rows back and toward the middle of the room. Cabel is still staring at her, looking incredibly puzzled. He shakes his head just slightly. She looks at the chalkboard. Not seeing it. Just wondering. Wondering what the hell is wrong with her. And what is wrong with him, that he has dreams like that. Does he know? Did he see her in that one? A wad of paper lands on Janie's desk. She jumps and slowly looks over to Cabel. He is slumped in his seat, doodling on his notebook, looking a little too innocent. I loved the way this very brief style emphasized the constant strain Janie lives under and how it becomes difficult to breathe as things begin to spiral out of her control. Janie and Cabel are both sympathetic, flawed characters and I cared about them very much. Everything about this book is fleeting. I read this through in one sitting, glued to the page, anxious to figure things out along with them. I look forward to finding out more in Fade. This looks great. I haven't heard of the series, but I have to say I'm most intrigued by the storming-out-of-the-school-dance scene you described. He scoots her home on his skateboard? That's the cutest, yet hippest thing I've ever heard. I will live vicariously through this book for sure. That's what it's all about, right? At first this one wasn't doing much for me, but around page 70 I was sucked in completely and couldn't stop reading. Your review really captured what makes this one so good. (I really loved Janie and Cabel together.) And, like you, I'm definitely looking forward to finding out what Fade has in store for them. Kos, that scene came out of nowhere and made me smile so big. Just like you said. So cute and hip and awesome. Chelle, I agree. I love it when two kids really need each other. Equally. And it's not one leaning more on the other for support. Janie and Cabel deserve each other after what they've been through. Once again, Angie, you nail the same thing I love so about this book. The abbreviated sentences are so hypnotic, really put you in the moment! I really liked this one and can't wait to read Fade. I felt the same way as you in the beginning and picked up a library copy to read. Then I fell in love with it and bought FADE.